Here's a quick and easy meal prep idea that we whip up weekly over here... It's really simple, and the ingredients can vary, but the main plan is: ALL THE VEGGIES! We roast up two pans of this mix early in the week with whatever is fresh and in-season. The first night we usually eat the veggies in a big bowl topped with some grass-fed ground beef that we've cooked up with taco-style seasonings, and top the whole thing with fresh salsa for a veggie-packed taco bowl. (You can make awesome regular tacos this way too!) And the next few days we'll use the veggie mix for lunch salads, or even topped with eggs for breakfast. This recipe is Sugarfreed APPROVED! Beets, golden beets, turnips, sweet potato and purple sweet potato, red potato, red pepper, carrots, yellow squash, leeks, zucchini, celery, kale, chard, brussels sprouts. NOTE: You can use about HALF this number of types of vegetables and it will still be delicious! My big tip is to make sure to add leeks or onions, and at least one of the potatoes, for the most delicious combo of flavor and texture. Sprinkle with seasoning - I use an all purpose seasoning salt. You can find clean versions of these at Trader Joe's, Costco, or lots of Farmer's Market stands sell seasoning blends. Another solid mix is to use garlic powder, Italian seasoning, salt & pepper. Get creative! Roast at 350 degrees for 30-40 minutes. If you like crispier veggies, you can turn the temp up to 375, and cook for less time. Remove from the oven, let cool, and serve right up! 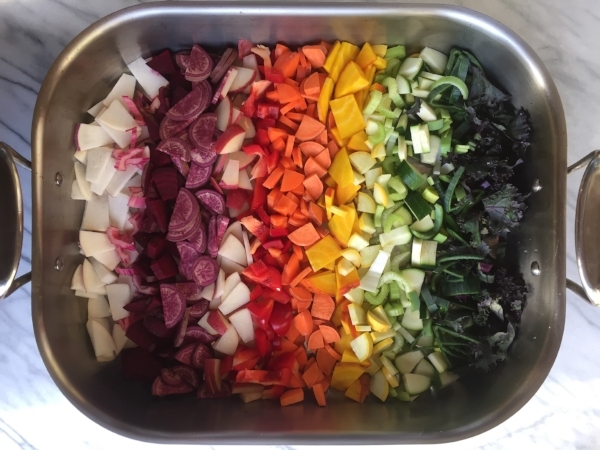 These veggies keep in the fridge for 4-5 days. BOOM! The HEALTHIER version of "Taste the Rainbow!" If you try this recipe, snap a pic and send it to me or tag me on Instagram!I love to see what you're creating!